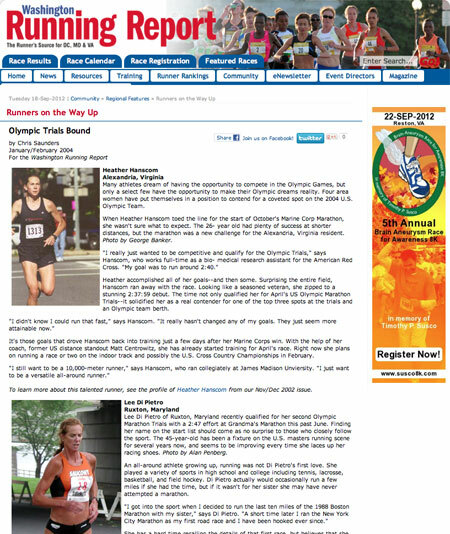 Lee Di Pietro of Ruxton, Maryland recently qualified for her second Olympic Marathon Trials with a 2:47 effort at Grandma’s Marathon this past June. Finding her name on the start list should come as no surprise to those who closely follow the sport. The 45-year-old has been a fixture on the U.S. masters running scene for several years now, and seems to be improving every time she laces up her racing shoes. Photo by Alan Penberg. An all-around athlete growing up, running was not Di Pietro’s first love. She played a variety of sports in high school and college including tennis, lacrosse, basketball, and field hockey. Di Pietro actually would occasionally run a few miles if she had the time, but if it wasn’t for her sister she may have never attempted a marathon. She has a hard time recalling the details of that first race, but believes that she finished somewhere in the 4 hour and 30 minute range. Her improvement has been steady ever since, despite spending many years devoting most of her time to the triathlon. She spent five years competing professionally on the triathlon circuit before putting all of her focus on running. After what she considers a miserable experience at her first trials race in 2000, Di Pietro hopes that her experience in St. Louis is more enjoyable. She plans on running a half marathon in January or February in preparation for April’s race, and isn’t ruling out the possibility of trying to qualify for a third Olympic Trials in the future. For more information about this national-class runner, please read a Profile of Lee DiPietro from our May/June 2000 issue.